The Central Naval Command (CNC) has begun a riverine and sea exercise tagged: “Ex Toru-Gbown”. The Flag Officer Commanding (FOC) CNC, Saidu Garba, flagged-off the exercise on Wednesday at the Nigerian Ports Authority Jetty in Warri, Delta. Mr Garba said the three-day exercise would take place in Bayelsa and Delta states. Ex Toru-Gbown means ‘water protection’ in Ijaw Language. The FOC noted that the command had the responsibility of providing adequate security in the area, and gave the assurance that it would continue to discharge its duties diligently. “So far, our operations have recorded huge success in reducing crude oil theft, pipeline vandalism and other maritime crimes. “Ex Toru-Gbown is a riverine exercise scheduled for the fourth quarter of 2018. “Last year, the command, in a similar fashion, hosted ‘operation Octopus Grip’. “Our presence here today is an indication of the Nigerian Navy’s commitment to safeguarding the nation’s maritime environment, which is filled with illegalities,’’ he said. 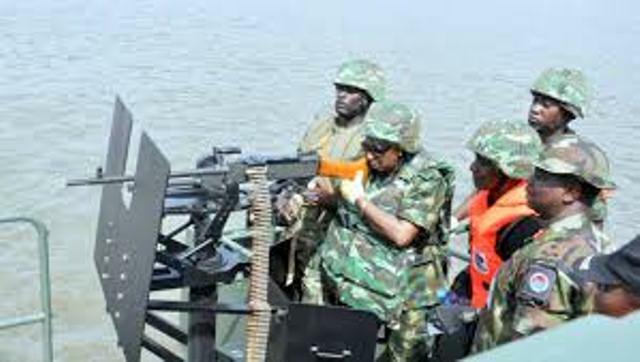 The FOC said the exercise was aimed at assessing the combat readiness of the command and the capability of specific bases/units in conducting riverine and checkpoint operations, among others goals. He said the navy was providing an environment that would enable sustenance of economic activities, including shipping and oil and gas production. Earlier, the Central Fleet Commander and the Officer in Tactical Command, Sunday Oguntade, said the command could handle cases of hijack or kidnapping at sea.